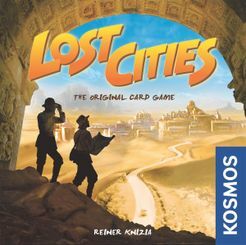 Buy Lost Cities and PriceWatch, Buy this board game at the Lowest Price. The point of Lost Cities is to score points by playing cards of a particular color, each color representing a separate expedition. The cards are valued 2-10 and the hook is they must be played in ascending order, you can skip any cards you like but the one being played always has to be more than the one played before it. There are also cards that allow you "invest" in your expedition before it starts to multiply the points you eventually gain (or lose from it). Each player starts the game with 8 cards in their hands and on their turn can take one of two actions, they can play a card to start or add to an expedition, or they can discard a card into a pile specific to that card's color. In the second phase of the turn the player either draws a card from the draw pile or picks up a card on one of the discard piles. This way each player will maintain that 8 card hand the entire game. Starting an expedition costs you 20 points off the bat, so before scoring any points you'll need to use the cards to make up that deficit, so before deciding to start playing cards of a particular color you better try and make sure you have more than a 2-3-4 to play there (If that's all you played for example that expedition would be worth -11 points at the end of the game). This is where the math comes in to able to start with negative numbers and work them back into the positive to score some points. Those investment cards up the stakes, and multiply the final score by X2 X3 or even X4 points if you played all 3 investment cards of a particular expedition. Not hard how to see how beneficial or detrimental those could potentially be on your final tally. Typically you're not going to make an attempt on every type of expedition, as normally that just spreads you out too thin. But you want to be careful with what you discard, and when. Just because I'm not taking a run at the Green "jungle" expedition doesn't mean I just want to throw those cards away, especially if they're a high value. If I discard the "9" green card I can be quite sure my opponent will grab it, and I just handed them those points. Since you can only play cards of a higher value you want to try and hang onto those cards until after they can't be used, or try and dump them when they have too many things going on and the game dwindling down. The game is over when the draw pile is exhausted, and since you can choose to draw from the discards instead there is a way to sort of slow the game down by never drawing from the draw pile. On the opposite side if your opponent is trying to slow down to get in more turns you can always burn and turn cards off the draw pile only to speed things up.